The planet Jupiter is always fascinating to watch. Not only do surface features pop in and out of existence on its swirling cloud tops, but its super fast rotation — once every 9.9 hours — assures its face changes rapidly. And the motion of its four large Galilean moons is captivating to observe as well. Next week offers a special treat for well-placed observers: a triple shadow transit of the moons Callisto, Europa and Ganymede on the evening of June 3rd. 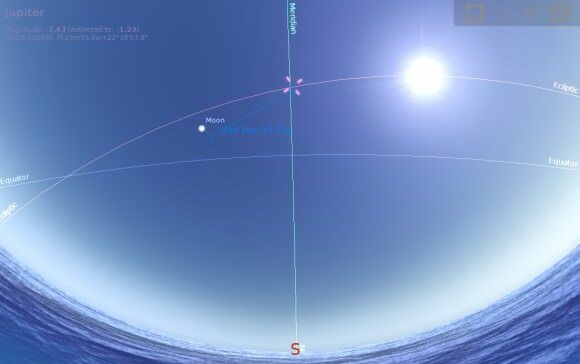 The view at 19:00 UT/3:00 PM EDT on June 3rd. Credit: Starry Night Education Software. Now for the bad news: only a small slice of the planet will witness this rare treat in dusk skies. This is because Jupiter starts the month of June 40 degrees east of the Sun and currently sets around 11 PM local, just 3 hours after local sunset. Never fear, though, it may just be possible to spy a portion of this triple transit from North American longitudes with a little careful planning. The action begins on June 3rd at 15:20 Universal Time as Callisto’s shadow slides on to the disk of Jupiter, to be followed by Europa and Ganymede’s shadow in quick succession hours later. All three shadows are cast back onto the disk of Jupiter from 18:05 to 19:53 UT, favoring European and African longitudes at sunset. The final shadow, that of Ganymede, moves off the disk of Jupiter at 21:31 UT. The hemisphere of the Earth facing towards Jupiter from the beginning of the triple shadow transit to the end. the red line marks the day/night terminator. Credit: Stellarium. Triple shadow transits of Jupiter’s moons are fairly rare: the last such event occurred last year on October 12th, 2013 favoring North America and the next won’t occur until January 24th, 2015. Jean Meeus calculated that only 31 such events involving 3 different Jovian moons either transiting Jupiter and/or casting shadows onto its disk occur as seen from Earth between 1981 and 2040. The June 3rd event is also the longest in the same 60 year period studied. The 1:2:4 orbital resonance of the Jovian moons Io, Europa and Ganymede. Credit: Wikimedia Commons. Can four shadow transits occur at once? Unfortunately, the answer is no. The inner three moons are in a 1:2:4 resonance, meaning that one will always be left out of the picture when two are in front. This also means that Callisto must be included for any triple shadow transit to occur. Next week’s event sees Callisto, Europa and Ganymede crossing in front of Jupiter and casting shadows onto its disk while Io is hidden behind Jupiter in its enormous shadow. Callisto is also the only one of the four large Jovian moons that can “miss” the disk of Jupiter on certain years, owing to the slight inclination of its orbit to the ecliptic. Callisto thus doesn’t always cast a shadow onto the disk of Jupiter, and we’re currently in the middle of a cycle of Callisto shadow transits that started in July of 2013 and runs through July 2016. These “Callisto transit seasons” occur twice during Jupiter’s 11.8 year orbit, and triple shadow transits must also occur within these periods. So, what’s a North American observer to do? Well, it is possible to spot and track Jupiter with a telescope in the broad daylight. Jupiter rises at around 9:20 AM local in early June, and the waxing crescent Moon passes 5.4 degrees south of it on June 1st. The Moon stands 30 degrees from the planet on June 3rd, and it may be juuusst possible to use it as a guide to the daytime event. A “GoTo” telescope with precise pointing will make this task even easier, allowing you to track Jupiter and the triple shadow transit across the daytime sky from North American longitudes. But be sure to physically block the blazing June Sun behind a building or structure to avoid accidentally catching its blinding glare in the eyepiece! The orientation of Jupiter, the Moon and the Sun at 4PM EDT on June 3rd. Credit: Stellarium. Do the shadows of the moons look slightly different to you? A triple shadow transit is a great time to compare them to one another, from the inky hard black dot of the inner moons Europa and Io, to the diffuse large shadow of Callisto. With practice, you can actually identify which moon is casting a shadow during any transit just by its size and appearance! A study of three multi-shadow transits: last year’s (upper left) a double shadow transit from early 2014 (upper right) and 2004 (bottom). Photos by author. Shadow transits of Jupiter’s moons also played an interesting role in the history of astronomy as well. Danish astronomer Ole Rømer noted that shadow transits were being observed at slightly different times than predicted depending on the distance of Jupiter and the Earth, and made the first rough calculation of the speed of light in 1676 based on this remarkable insight. Celestial navigators were also intrigued for centuries with the idea of using the phenomena of Jupiter’s moons as a natural clock to gauge longitude. It’s a sound idea in theory, though in practice, it proved tough to make accurate observations from the pitching deck of a ship at sea. Jupiter captured near the daytime Moon. Photo by author. Miss the June 3rd event? There’s still two fine opportunities to see Jupiter do its impression of the Earth-Moon system and appear to have only one satellite – Callisto – on the evenings of May 30th and June 7th. From there, Jupiter slides lower into the dusk as June progresses and heads towards solar conjunction on July 24th. Let us know if you manage to catch sight of this rare event! -Send those shadow transit pics in to Universe Today at our Flickr forum. Jupiter is a happening place in the solar system. While bashful Mars only puts on a good show once every two year opposition period, and inner worlds such as Mercury and Venus yield no surface details to backyard observers at all, the cloud tops of Jupiter display a wealth of changing detail in even modest backyard telescopes. And this month is a great time to start observing Jupiter, as the largest planet in our solar system just passed opposition on January 5th. Recently, veteran astrophotographer Michael Phillips amazed us here at Universe Today once again with a stunning time-lapse sequence of Jupiter and its moons Ganymede and Io. Now, he’s outdone himself with a new full rotation compilation of the gas giant planet. The capture is simply mesmerizing to sit and watch. At 9.9 hours, Jupiter has the fastest rotational period of any planet in our solar system. In fact, with Jupiter currently visible low to the east at sunset, it’s possible to follow it through one rotation in the span of a single long January winter night. We caught up with Michael recently and asked him about this amazing capture. The sequence was actually accomplished over the span of five successive evenings. This made it challenging to stitch together using a sophisticated program known as WINJupos. Planetary photography also requires special considerations prior to imaging, such as getting Jupiter high enough in the sky and at specific longitudes to get full coverage in the rotation sequence. In fact, Jupiter is currently in a region in the astronomical constellation of Gemini that will be occupied by the Sun in just over five months time during the June Solstice. Currently at a declination of around 22 degrees 45’ north, Jupiter won’t appear this high in the northern sky near opposition again until 2026. Both sequences capture a wealth of detail, including the enormous Great Red Spot, the Northern and Southern Equatorial Belts, and numerous white spots and smaller swirls and eddies in the Jovian atmosphere. To date, six spacecraft (Pioneer 10 and 11, Voyagers 1 and 2, New Horizons and Cassini) have made flybys of Jupiter, and one, Galileo, orbited the planet until its demise in 2003. Juno is the next in this legacy, and will be inserted into orbit around Jupiter in July 2016. Now is the time to get out and observe and image Jupiter and its moons, as it moves higher into the sky on successive evenings towards eastern quadrature on April 1st, 2014. Congrats to Michael Phillips on an amazing sequence!